The Pentagon's enthusiasm to build tech partnerships in Silicon Valley is unlikely to cool, analysts say, despite the employee pushback that recently led Google to not renew a contract that allowed the military to use artificial intelligence tools to analyze drone footage. Silicon Valley's cutting-edge work increasingly has made it an attractive place for the Pentagon to look for a defensive edge. That's why military officials recently opened an outpost in Mountain View to build relationships with technology startups and major players. 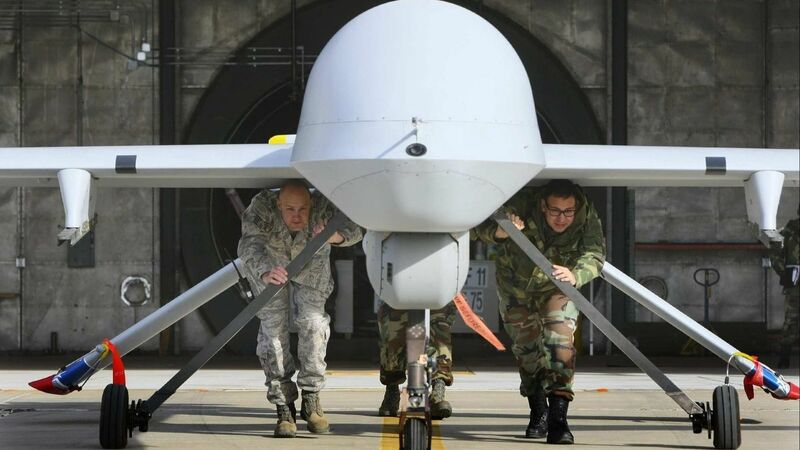 The Pentagon's enthusiasm to build those tech partnerships is unlikely to cool, analysts said, despite the employee pushback that recently led Google to not renew a contract that allowed the military to use artificial intelligence tools to analyze drone footage. Google's decision reportedly came after almost 4,000 employees (Alphabet, Google's parent company, has a total workforce of 85,000) signed a letter asking Chief Executive Sundar Pichai to end the contract for Project Maven and stop all work in "the business of war." At least a dozen employees resigned over the issue, according to Bloomberg. Last week, Pichai laid out a set of principles for Google that bans artificial intelligence work involving weapons or surveillance that violates "internationally accepted norms," and that endorses applications that are "socially beneficial," "built and tested for safety," and "accountable to people." He noted, however, that Google would continue to work with governments and the military in other areas, such as cybersecurity. The military-tech relationship has flipped from the early years, when the Defense Department acted as an investor in and customer for high-tech products that later worked their way into industry. Development of the ENIAC computer in the 1940s was funded by the Army to calculate weapons trajectories, after all, and the beginnings of the Internet were created in the '70s with funding from an arm of the Pentagon. It wasn't until after the Cold War that commercial applications supplanted the military as the primary driver of innovation, especially with development of the personal computer and mobile devices. The Senate Armed Services Committee's markup of the 2019 National Defense Authorization Act allocated $150 million and directed the undersecretary of Defense for research and engineering to work on developing Pentagon relationships with academia and the commercial tech industry. The payoff: contracts such as the $927 million deal that Microsoft Corp. landed in 2016 with the Defense Information Systems Agency to provide technical support services. "Silicon Valley firms are leading in a number of sectors of technology that have increasing relevance to national defense," said Tom Mahnken, president of the Center for Strategic and Budgetary Assessments. In 2015, the Pentagon opened the Defense Innovation Unit Experimental, or DIUx, an entity based in Mountain View, Calif., with offices in the Pentagon; Austin, Texas; and Boston that provides capital — without taking an ownership stake — to companies to work on prototype projects that address problems faced by the U.S. military. A year later, the Defense Innovation Board was set up to advise the Defense secretary on crucial future challenges, including business concepts and technology applications. Chaired by Eric Schmidt, former Alphabet executive chairman and the company's current technical adviser, the board includes university professors as well as tech executives. "If you ask the fundamental question are the linkages between the valley and the Pentagon deepening all the time, the answer is a clear yes," said Paul Bracken, professor of management at Yale University who has studied the role of technology in defense and has served as a consultant to the Defense Department. That includes areas such as cloud computing, which the Pentagon sees as a way to modernize and secure IT systems. Last year, Amazon.com Inc. unveiled a cloud computing service available to the U.S. intelligence community called the Secret Region. A press release about the announcement included an endorsement by John Edwards, chief information officer for the CIA, who said it was a "key component" of the intelligence community's cloud strategy. The deal upped Amazon's credibility in the marketplace "just at a time when cybersecurity was becoming one of the biggest issues around," Bracken said. "Not only is the technology better because it's being innovated under extreme circumstances, but you can get enormous credibility by servicing different markets under DOD because people view these systems as really tested." Concerns about weaponizing technology represent a small portion of DIUx's discussions with companies, said Sean Singleton, its director of business development and marketing. But artificial intelligence was raising difficult questions even before the Pentagon came calling. Some technologists — most famously, Tesla and SpaceX CEO Elon Musk — worry that its creators haven't fully thought through the implications of truly intelligent computers or the controls that would be needed. "Military uses of AI, in particular, is something that technologists in Silicon Valley are particularly cautious about," said Peter Eckersley, chief computer scientist and head of AI policy for the Electronic Frontier Foundation. "I don't think we would have seen this same type of backlash if this were a regular sale of Google Cloud services for the military to use for its internal engineering." In his numerous conversations with Google employees about Project Maven, "almost all" expressed alarm about or were opposed to the company's involvement in Project Maven, Eckersley said. "Many Googlers think that getting the deployment of artificial intelligence right is extremely important and should begin with getting it right," he said, and that a military application should be avoided until the technology was very well understood. Project Maven intended to use machine learning to pick out specific objects from imagery captured by drones, work that would be extremely time-consuming if done by humans. A Pentagon official said last year that the project's goal was to "turn the enormous volume of data available to the DOD into actionable intelligence and insights." "Google's AI principles are wholly insufficient for establishing ethical accountability across the industry," said a statement from the Tech Workers Coalition activist group, which circulated a petition calling for Google to not renew its Project Maven contract. "We join Google workers in their call for tech companies to agree to independent external oversight on how their AI is being deployed and used." "It's a core issue for both industry and the government to understand and figure out ways to ensure that these artificial intelligence applications that are being used for national security are reliable and can support accountability," Hunter said. "So when they are used for military purposes ... we know what they're doing and why they're doing that."